Creek Dogwood, Redosier Dogwood, Red-osier Dogwood, Red Osier Dogwood, Western Dogwood, Western Red Osier: Cornus sericea (Synonyms: Cornus xcalifornica, Cornus alba ssp. stolonifera, Cornus alba var. baileyi, Cornus alba var. californica, Cornus alba var. interior, Cornus alba var. occidentalis, Cornus alba var. sibirica, Cornus baileyi, Cornus instolonea, Cornus interior, Cornus occidentalis, Cornus sericea ssp. occidentalis Cornus sericea ssp. sericea, Cornus sericea ssp. stolonifera, Cornus sericea var. interior, Cornus stolonifera, Cornus stolonifera var. baileyi, Cornus stolonifera var. californica, Cornus stolonifera var. coloradensis, Cornus stolonifera var. interior, Cornus stolonifera var. occidentalis, Cornus stolonifera var. stolonifera, Swida instolonea, Swida sericea, Swida stolonifera) - Many stemmed shrubs from 2-6 meters high. Flowers cymose and not subtended by large bracts. 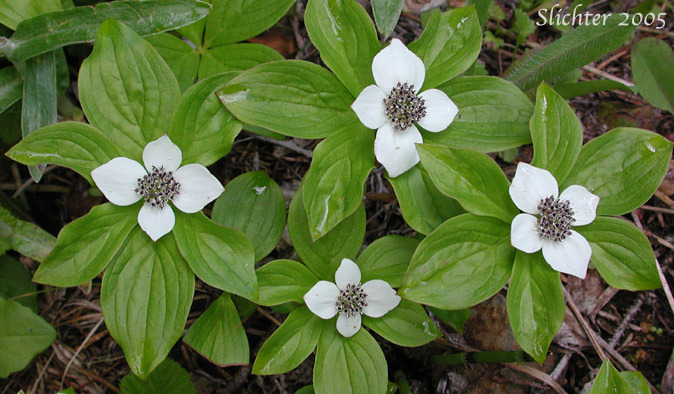 Bunchberry, Canadian Dogwood, Dwarf Cornel, Puddingberry, Western Bunchberry: Cornus unalaschkensis (Synonym: Cornus canadensis) - Low trailing subshrubs from 5-20 cm high. Leaves 2-8 cm long and in whorls at the ends of the erect stems. The flowers are in tight, globose cymes subtended by 4 white bracts from 1-2.5 cm long.